The Toyota Yaris is a simple compact car that is easy to drive and repair. If your handling is sloppy or the ride quality isn’t as comfortable as you think it should be, it might be time for new shocks and struts. Here is how to replace them. Is your Toyota Yaris not riding like it should? 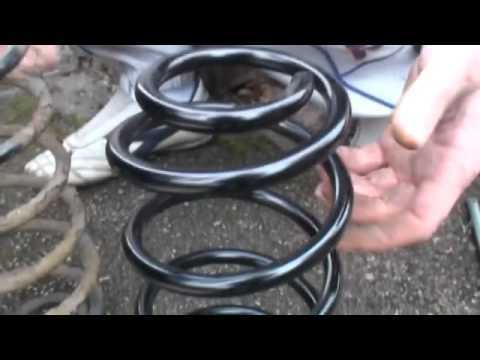 It might be time to replace your shocks. Here’s how. It is recommended that you replace your shocks and struts every 60,000 miles. In order to replace the front struts, it is simply a matter of removing the tire, removing parts and compressing the spring (if needed) and then putting it all back together. Loosen the lug nuts on the wheel, on the side you want to work on. Then, jack up the vehicle, secure with jack stands and finish removing the tire. Looking at the front spring strut, find and remove two bolts on the top of the steering knuckle. This should allow you to remove the front strut from the vehicle. With the strut out, you have two choices. You can take all the pieces of the strut apart, put a new spring on and then reassemble using vice grips and a torque wrench. Or, you can purchase a complete replacement with the new spring already installed. After you have fixed or replaced the strut, you will reverse the steps above to reassemble it. Then, you will want to take the vehicle for a test drive to make sure the repair is complete. Your ride should be stiffer than before with the new shocks. Also, when you are done test driving the vehicle, you will want to double check that all your bolts are tight. Following the same steps as the front, you will remove the tire, loosen bolts and then remove/replace the shock. First, after parking your vehicle on level ground, remove the rear tire for the side you want to work on. After removing the tire, you will see the shock. It is simply a matter of removing the top and bottom bolt that holds the shock on. After removing them, replace your shock with your new one and then reassemble everything you removed. Lastly, put the rear tire back on and take the vehicle for a test drive. The drive should feel stiffer. Congratulations, you have replaced your front and rear suspension parts. This should lead you to having a much better ride.